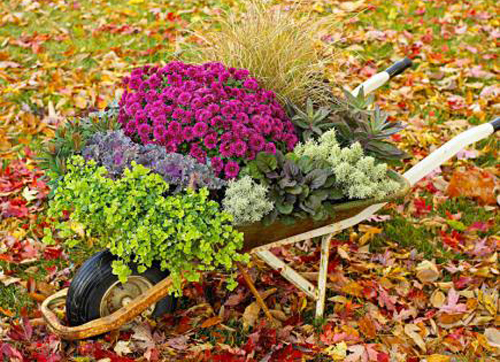 Using a wheelbarrow for a garden planter is so easy to do and just adorable. We saw this on Midwest Living website and wanted to share it with you. Filled with seasonal mums, purple flowers kale and purple tinged leaves of bugleweed, this idea is clever. Place in your yard where it can be seen by visitors and passer-buys. Perfect for Fall! 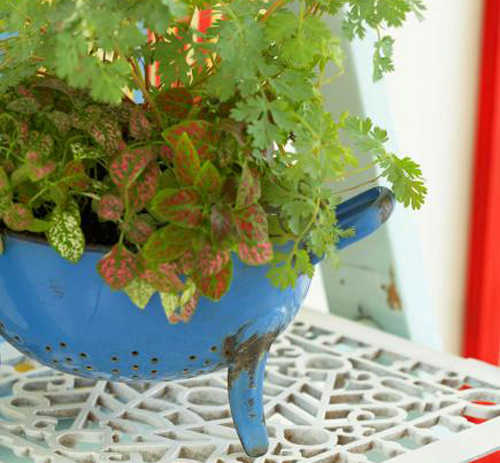 Colander Garden Container - A vintage colander makes a great container garden. It already comes with drain holes! This one is extra cute planted with parsley and polka dot plant. If this pot was filled with herbs it would be perfect on a kitchen counter. Placed on a patio or garden table it adds color and charm to any area. If you have a metal container, get paint for metal at any Home Depot store and paint the colander a bright color. Bold colored planters are perfect in any yard! Here is a tried and true garden idea. 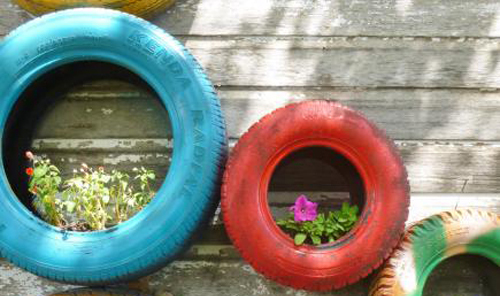 Take old tires, paint they a eye catching color and fill them with potting soil and bright colored flowers. Mount on a barn, shed or patio wall where you need some extra charm. These make great garden containers and can be potted as easy as a planter. There are a ton or more fun items that you can turn into garden planters. Old file cabinets, vintage crock pots, a child's toy wagon & much more. Just get imaginative and your yard and garden areas will look original, playful and colorful.